Gareth Patterson is a GP by day but he is a coffee aficionado 24-7. 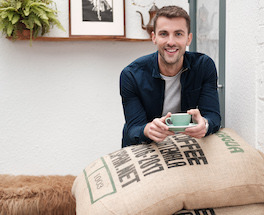 He has made it his mission to spread the word about where to find the best coffee in Northern Ireland. guides which give coffee drinkers the perfect way to experience the place. “At the core of our business is our love of coffee and our love for NI. We recognise how rapidly and successfully the speciality coffee sector has flourished here in recent years, and we believe without doubt that it rivals that of any other successful European destination. Our mission is to help to promote that locally and globally” says Gareth. “Through paper publications we map out some of the best independent speciality coffee establishments across our shores, offering coffee lovers a curated guide to where they can find the best coffee our country has to offer, from city hot spots to beach side hideaways.